An aspect of Teachmeet that I personally find rewarding are the relationships that are formed with fellow educators. Secondly, the introduction of various resources and web tool, excites me. On Saturday night @ShellTerrell mentioned this site Present.me which she heard at another teachmeet via @ElindaGjondedaj You can view my International teachmeet presentation using Present.me, below. Cheryl Arnett @c_arnett Craig, Colorado, USA Let's Go to Disneyland! Huge thanks to Icha and Cherry who were there with us, but didn't present due to technical difficulties and poor internet connection. You really did have a huge week. 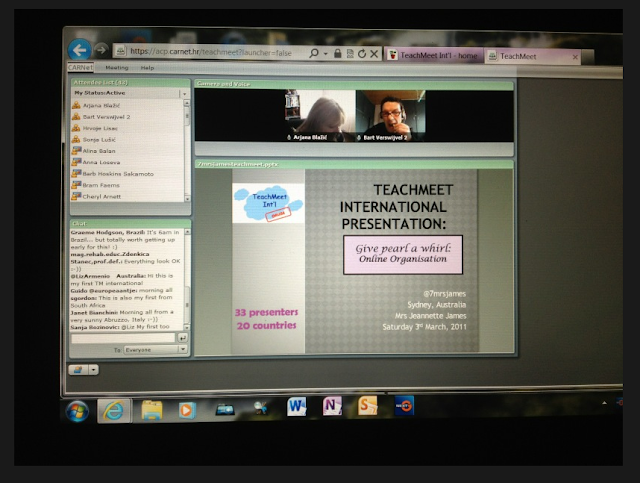 Didn't get to catch any of the TeachMeet International in real time, so was good to catch yours after the event. You were a great ambassador for Australia, great job! Wow! what a wonderful week of learning. It's great that we have so many different opportunites to connect, to share and to learn from each other. Thanks a lot for everything you do! Was a fantastic couple of weeks! I enjoyed following and supporting the first #tmbrisbane Teachmeet, you organised! Wonderful to see it eventuate, after you began planning last year. G'day my lovely Croatian pal! I love it - "wonderful week of learning" and I agree, the vast array of opportunities to connect and learn form each other is endlessly exciting!